Deacon Michael Medvec was born and raised in Brookfield, Ohio, to Edward M. Medvec and Louise Medvec. He attended Sacred Heart School in Sharon, PA and graduated from Kennedy Christian High School in Hermitage, PA. Deacon Michael married Donna Montabon in 1975 and they have three daughters, Lori Garon, Nicole DeWitt, and Alyssa Medvec, one granddaughter, Emma Garon, and one grandson, Mason DeWitt. He has been a member of St. Patrick Church since the mid 1980’s. He was ordained to the Permanent Deaconate for the Diocese of Youngstown in 2013. 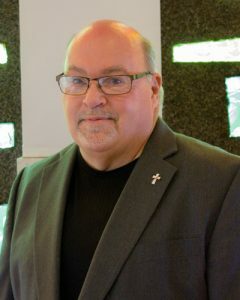 He also assists St. Patrick Parish through RCIA, Christ Renews His Parish, Hospital Visits, Sacramental Prep, is a member of Pastoral Council, Stewardship Committee and Liturgy Worship Committee.